Going to the library is one of our rituals, rain or shine… one day a week you will find us heading out to the library. We have a fairly chaotic library… where alphabetical, dewey and language are not really systems that are in play for organising the books. Maybe in the adult section of the library, but in the kids section it is categorised into small picture books and large picture books… chapter books and non-fiction. 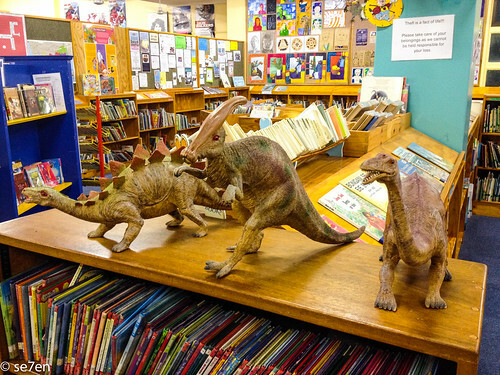 you have to know your library really well and be extremely vigilant if you are looking for a particular book… but mostly this is our “trip to the candy store” and my kids are simply looking for books they haven’t read before and the fatter the better. It is incredible that for the vast volume of books that we do take out of the library, how often we achieve this – vast piles of books that haven’t been read before are carried home on a weekly basis, devoured and returned!!! How do you actually go to the library… get out the door and go? I usually mention at the breakfast table that we are planning to go to the library that day. We always go to the library at the end of the day, and that gives anyone a chance who wants to quickly do a project or re-read a book time to do get that done before the end of the day. 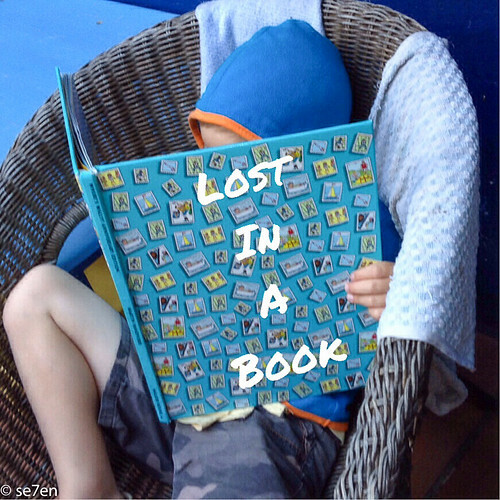 As we start to get ready for the end of the day chores… each person brings their pile of books to the table and a library bag… you can very quickly see if someone is missing a book and needs to go and look for it. Once all the piles are there… and we have ten piles of se7en books each and all the chores are done, we pack the bags and head out the door. 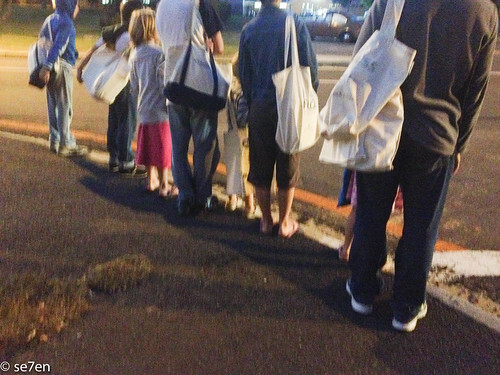 Everyone carries their own bag… and two young gentlemen carry an extra bag… ten bags of se7en books. So fair warning and not before the chores are done, means it is pretty much “game on” for a trip to the library. How do you keep track of all the books? 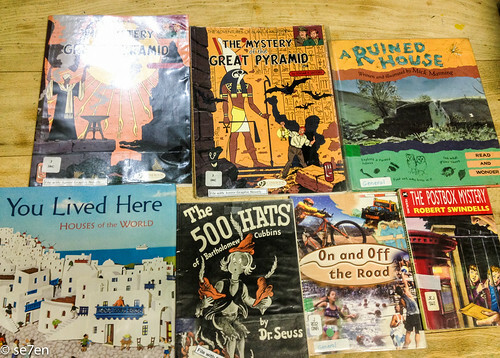 As we return home from the library… each child empties their library bag onto the kitchen table, I take a quick photograph of their books and then they take their books and the bag away. This is the age of digital folks, and a little trick that happens to be a life-saver. The bag gets put away and the library books go onto their library shelves. Each of the children have a box for their “current reads,” school books and library books all in one spot. It is much easier when you are planning a trip to the library to find that one missing book if you have a visual image of the book to jog your memory into gear. 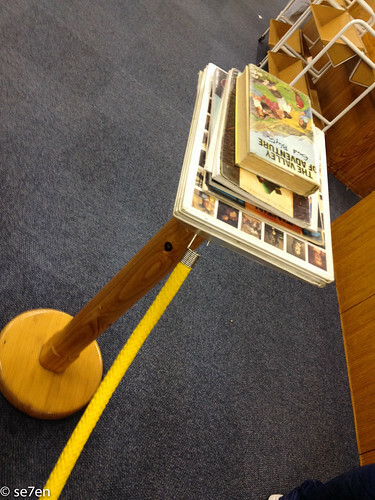 They are pretty good about keeping their books in one spot, because if a book is missing then we won’t go to the library again until it is found… we will just keep on renewing. There is a certain amount of peer/sibling pressure to prevent this from happening… everyone really wants to go to the library and get fresh books each week. Naturally we have unwritten rules: library books may not go out of the house, may not be jammed in a backpack to be read later… library books belong on the library shelf. How do you choose the books? I don’t choose the books, I wish I could, I love choosing books… but so do our kids and this is their treat. They are in a children’s library… packed with good books for children, and of course there are some books that are not great and some that are just “air.” But just like I was left to choose books when I was a child I let my kids choose their own too. They all have a different route they take… past the picture books, some have to stop and look at all the graphic novels in case there is something new… and otherwise a visit through the non-fiction and on to their novels. They pretty much choose what they like in the library and I do slightly veto certain books… those in a different language (I will read them Afrikaans, but my Xhosa and anything else is way too weak to read), or someone is trying to take out se7en Star Wars books (every.single.week), or books that are simply horrible. They all choose their own books and I do a quick peak with each of them before they check them out. What do you do about inappropriate choices? This is a big issue for many parents… and I have written about it here and there before. I really feel that my children need to learn discernment and that they can only learn that by making mistakes. Obviously I wouldn’t let them take out books that were totally untoward, but if they want to take out books that are “weak or piffling” then I let them… they quickly realise that to use up their precious card space on a series of “glitzy books” that can be read in five minutes flat, will leave them empty handed for the rest of the week. So while they make mistakes from time to time, they quickly learn to avoid books that won’t provide them with substance. The library like the internet is a place where plenty of life skills, especially discernment need to be learnt. What do you do about terrifying librarian? For years we had a very intimidating librarian, so much so that I would leave my children at home and dash out to the library and pick books for them. I could never understand the ogre at the desk until one day she conspiratorially whispered that she didn’t believe that a library was the place for children, rather a place for books. Well that made perfect sense and I totally understood why she never wanted us to take a huge pile of books out of the library each week – books belong in the library “and all that”!!! Our family were terrified of her and I could write a Roald Dahl novel with that librarian as the lead player… but we have a new head librarian and all that was once draconian is now lovely!!! Talk about a dramatic difference throughout the library… I used to have to stand at the desk and have one librarian check out all seventy books… but now the gang take their cards and their books and check them out themselves. And the most dramatic result: folk in the queue behind us don’t complain nearly as much when a collection of kids each stamp out a couple of books instead of one adult stamping out a lot of books. What to say to the Librarian? While some kids might stare wide eyed and horrified at a strange adult speaking to them… mine don’t. So instead of instructing mine to say “Hello, how are you?” and genarilized please and thank you’s all round… I have to train these somewhat verbose children to actually listen to what the librarian is saying and asking them, before they launch themselves into a diatribe about every single book that they have ever read… just be gentle on the librarian’s ear… in fact all folk for that matter. 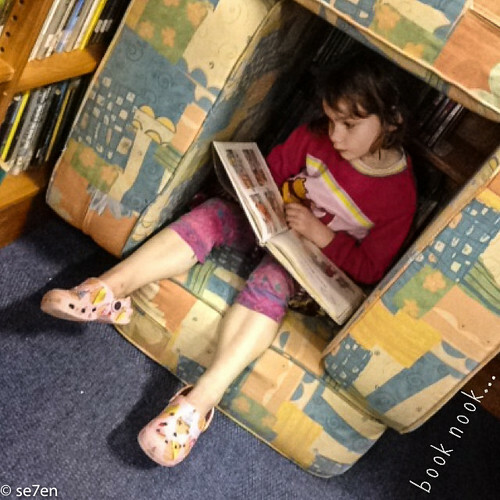 How do you get your kids to behave in the library? Well… It’s not just the library. Venturing out with kids anywhere can be a very humbling experience and I have written about it here. That being said – there are certain behaviours that are not best in the library… running about and shouting is not going to gain you any popularity, while being excited about a new book is fine. Building a house out of the cushions to read in is acceptable… pilling up the cushions and starting a pillow war is fairly unacceptable. Talking in a quiet voice is okay and sitting at the table reading a book is commendable. Yes, I’ve been through all of that… we have a little huddle and a reminder about expectations before we go into the library, every time. If someone really can’t behave we leave… we have only ever done that once and you can imagine the effect of se7en siblings all wanting to take books out being taken home without books. Galactic fail… everyone just behaves well enough, not perfectly, but well enough. Considering the long loud chats that adults have in the library, the heaps of folk who don’t turn their phones off, or worse, eat snacks and push in front of kids in the queue… One of my pet hates is when adults are “allowed to behave badly” but children are expected to behave perfectly… just no. Do you read all the books? Yes we do… They each have se7en books out on their card – so that’s a book a day. My older kids read at least a book a day, everyday. There is a lot of swapping and exchanging of books and by the end of the week all the books are read. My little guys all get a story a day… sometime in the day, not always before bed. So in a week the books are all read. I use the two adult cards to get books that everyone will find interesting… a couple of fact books, or fun poetry, new things to try, a travel guide or just a good book we can all enjoy together. I usually take one or two school books out the library and let them lie on the table too… that way they get a smattering of what is expected from children their own age in school. So that’s our library story – if you have a long lazy summer ahead of you or a cold wet winter beating on the window pains… the library is the key to finding something to read and something to do, for all of us. Awesome tip to photograph books brought home! what a great idea to take photos of the books!!! Confession – I’ve been staying away from the library because I totally lack self-control with books. But maybe I need to “man up” and start taking them for a weekly “treat”. “se7en Star Wars books (every.single.week)” – haha, I can so relate! And photographing books – genius! Love the tip about taking a photo of the books. Why have I never thought to do that? Your children have a wonderful book habit. I hope they continue to enjoy the library. Hay Nita… So glad you liked the photograph tip… the whole process takes about five minutes… and it has saved the day so many times!!! Hope you are having a fabulous weekend!!! 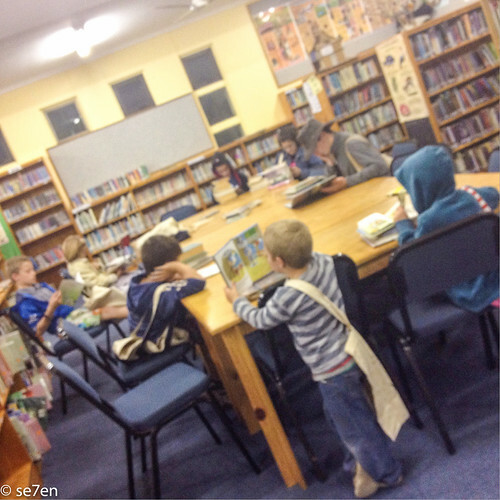 Marcia, I think your kids would love the library… love it. For my guys in that age group I make sure that they choose books that I really want to read to them!!! Or I give fair warning that, while we are still in the library that some books are too long, or too many pages and pages of facts, well mainly just too long (! )… that they can take them and they will enjoy them, but I won’t be reading them to them… it sounds mean but I tell you Cinderella spread over fifty A4 pages with paragraph after paragraph is no fun for the reader or the listener!!! Give it a try a couple of times, and if it doesn’t work then wait a while and try again later. But I tell you the truth, I think you are missing out on tons of fabulous fabulous kids books, that you needn’t be buying, in their age group… picture books are magical and you will love them as much as they do. Hope your weekend is a totally fab one!!! Oh Debbie, Se7en Star Wars books… again and again and again and again… I will be enthusiastic, this child will move on… e.v.e.n.t.u.a.l.l.y.!!! Hope you are all having a fun weekend and you have found some warmth somewhere!!! Hay Cheryl… I kind of hope this habit lasts a lifetime!!! It is one of my best time with my guys ever, we always come home feeling on top of the world ready to dive into a whole lot of new books… Hope you are all having a wonderful weeknd!!! I love getting new books out the library every week for my 16 month old and our children’s library is really really nice with tons of kids books I remember from when I was young. Trying to stop her taking lots of books off the shelf while I am looking is a bit difficult though. Thank you for that post. When I told my children that you are allowe to take only 7 books on a card they were horrified, but then they calculated that you can take a lot of books anyway. There is not a top number of books that we can take home from our library: the number is limited by me how many books we could carry (we still use the children’s push chair), but eventually they will have to start carrying their books sooner or later. Have a nice week! Hay Sanna, good to hear from you. I just know that your little one would enjoy the library… books and shelves!!! To an adult books are meant to be on shelves and to a child – not!!! I used to try and get mine to sit at the table and read momentarily – it was such a novel idea to have their own little chair that it worked… but really only for one moment!!! Wishing you a great week. Hay Vida… I have to ask… how do you know when to stop taking books out. for us it is very good to have a limit and a book a day seems like a good limit!!! I think my guys would each take a shopping cart of books given the opportunity – I would be reading a lot of picture books every week then. Hope you have a great week too!!! I also take photos of the books. Have not been in a while but really need to soon. 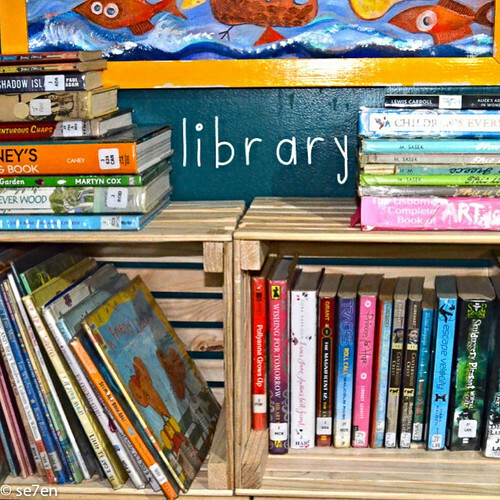 We have a great library at school too so they borrow there – what is lovely is that it is arranged according to grades appropriate – so it makes it easier . They are however allowed to take out in older grades if they are classed as an “Advanced reader” for their grade – which both my grade 1 and 3 is. Our grade 1 class also have our own little library – we each gave 2 books to it at the beginning of this term and the kids are lending from it with a list system. We then get them back and swop every term. Hay Cat, Good to hear from you… and so good to hear other folk also take photographs – I am not the only one who breaks out in a panic at the thought of losing a library book!!! 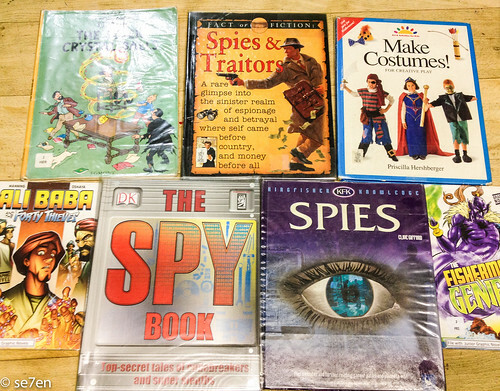 I love the idea of your class library, it’s a fab idea, and a great way for kids to read the same books so they can talk about them and share ideas – totally brilliant idea!!! Hope you are all having a good week!!! Hi Emm, So glad you enjoyed this tip!!! I know it took me ages to figure out too – for the longest time I wrote a list… but I will never look back from a quick photograph!!! Wishing you some fabulous reads over your summer!!! Mrs Ff, It has taken years to perfect the art of going to the library… when our kids were all tiny there was a terrifying children’s librarian and I used to leave the kids at home and pick books for the children myself. Now it is easy enough to all head out… give it time and it will work out. Hope you have a great weekend!! !